Hello everyone, Astrid here from the UK and I would like to start by wishing you all the most wonderful, peaceful and fulfilled Holiday Season!! Today I am sharing a cover I made for a mini book that is going to contain photos of our family Christmas. My grand daughter is over from Australia and I know there will be many treasured memories to scrap. 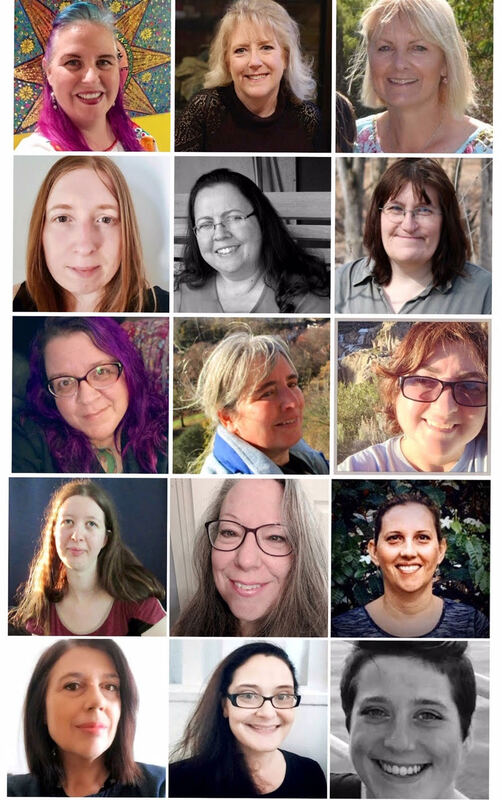 1.I started by creating the central panel. 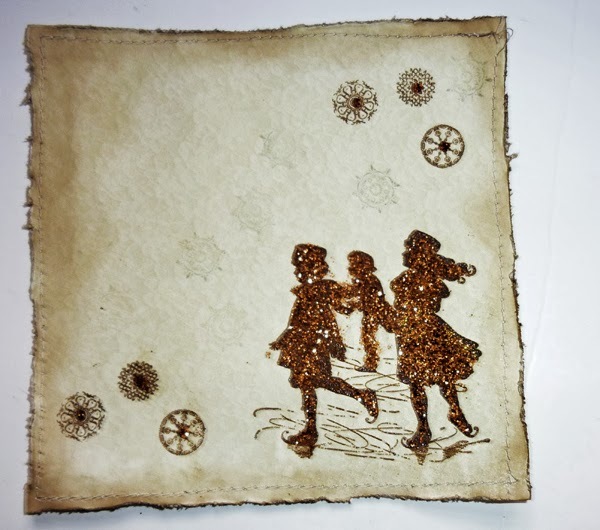 I cut the piece of cream coloured card to 5.5 b 5.5" and stitched around the edges with my sewing machine. (This step could easily be left out). 2. Next I distressed the edges and inked around the outside with Vintage Photo Distress Ink and stamped the skating children and some of the snowflakes in Potting Soil Archival Ink. 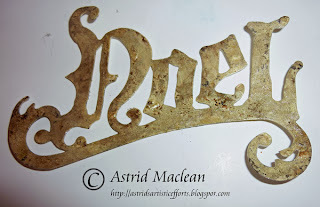 I also did some first and second generation stamping of the snow flakes with Iced Spruce Distress Ink. 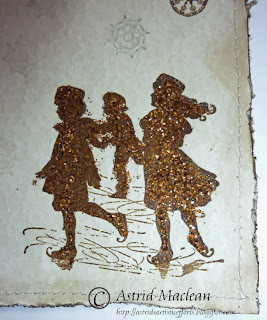 I then glittered the children and the centre of the brown snowflakes with Vintage Photo Distress Glitter. 3. Next I worked on the word Noel die cut, this was a gift from a friend and came from another Tim Holtz/Sizzix Die. 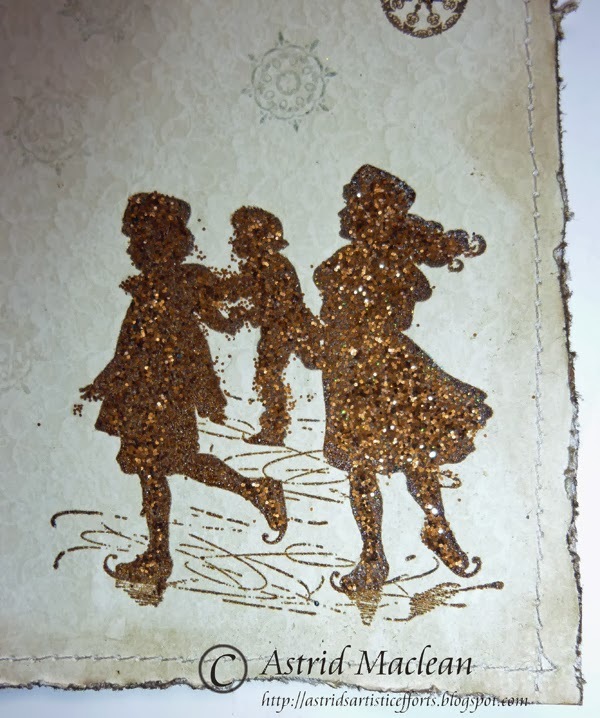 I dabbed it with the Antique Linen Distress Paint and when dry dabbed some Potting Soil Archival ink over it. 4. Time to create the actual covers. For this I cut two pieces of the buff card to 8.5 by 10"
For the spine I cut a further piece to 8.5 by 3" and scored it 1 3/8" in from both sides, leaving me with a 1/4" bit in the middle. I gave one of the sides a decorative edge. I glued that around the two covers on the outside. 5.For the inside I created an accordion binding by scoring a bit of 8.5 x 6" card every half inch. 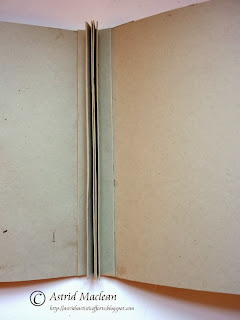 I then folded it accordion style and glued in place on the inside of the covers as you can see from the photo. 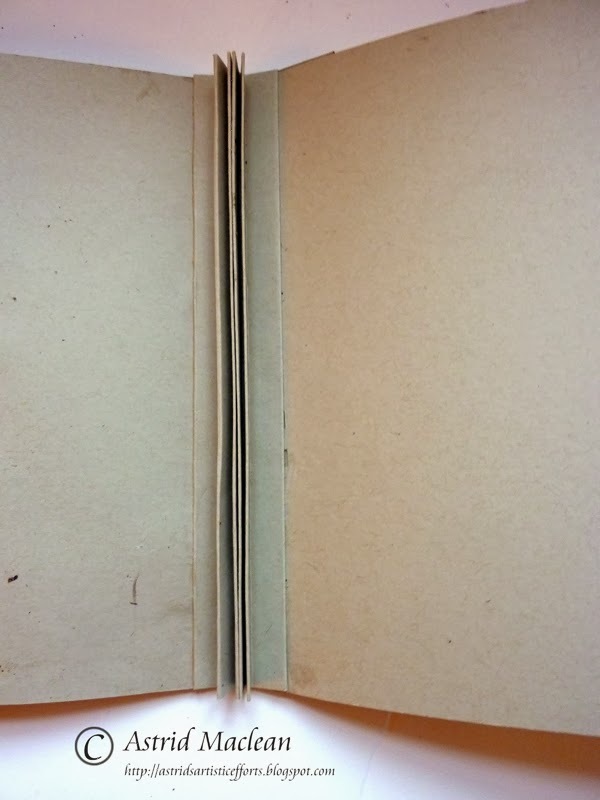 The inside pages will later be tucked in between the folds and glued in place. 6. Before adhering the central panel to the covers I inked the corners from the back and curled the edges for a bit more interest. I cut the pine cone and branches from some scraps of card and coloured them with my two chosen colours of Distress Inks. I also cut various snowflakes and layered them up together and finally the whole thing was finished with some lace and beaded trim as you can see from the photos. 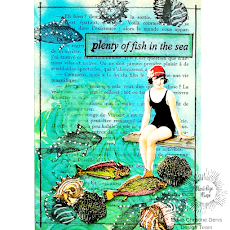 Well, I hope you like my mini book cover, I can't wait to start to design the inside pages and fill them with my holiday photos. Thanks you so much for visiting today and don't forget to spent some time being creative this holiday season!! 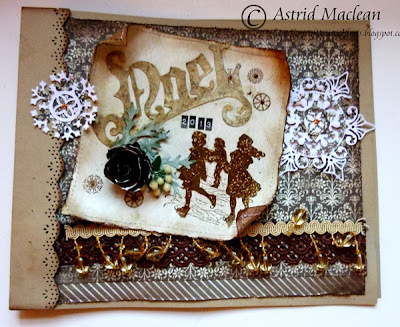 WAUW this is absolutely gorgeous as usual Astrid. I LOVE your cover and can´t wait to see the inside later too. Have a wonderful Holiday Season to everyone around here too. Absolutely stunning, as always. 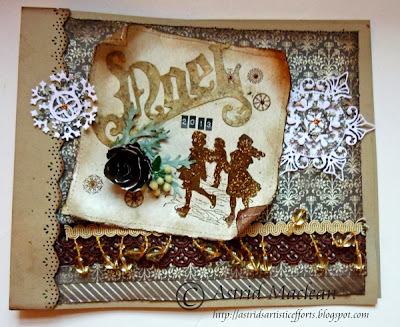 I love the vintage feel and how you used the Vintage Photo distress glitter is a very clever idea for the images. 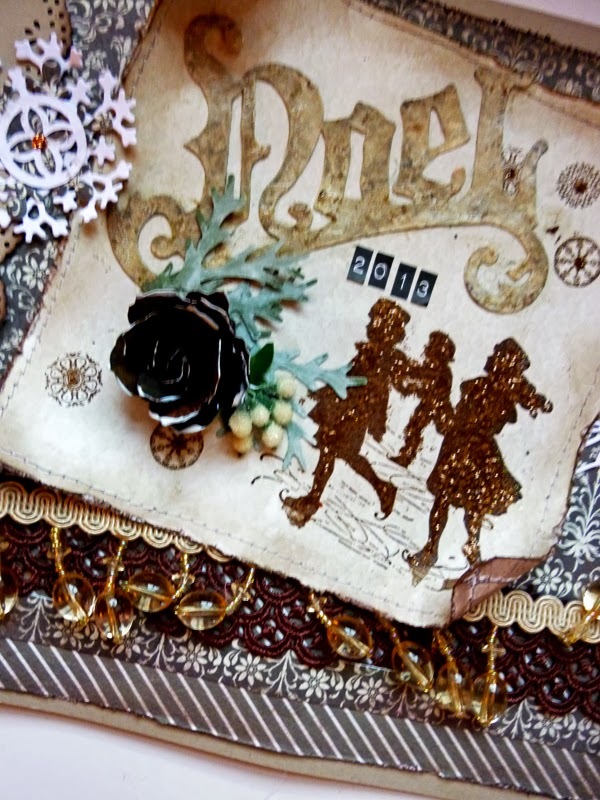 It is gorgeous, and the idea with the binding is great... love how you can add the pages between the folds.The stamped skaters are so sweet, and your snowflakes both stamped and cut are a wonderful add, giving all the more feeling of winter time. So fantastic a book, dear Astrid. 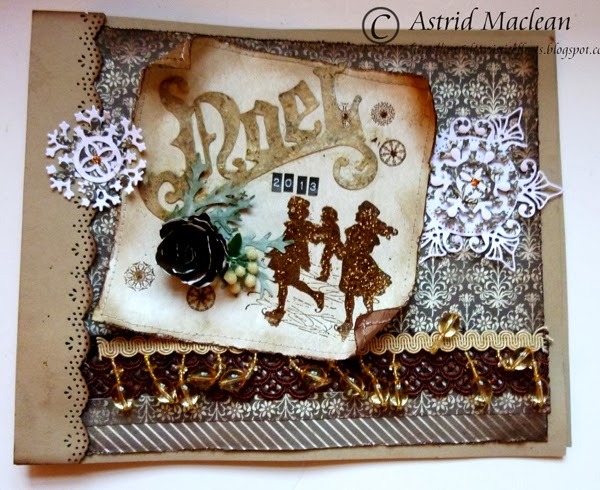 So delicious - love the sparkly skaters, and the dies look amazing - gorgeous work from Astrid!